A jig is not a jig. They are not all created equal. 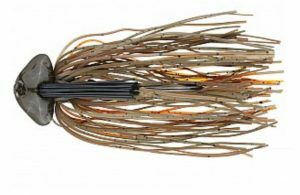 Specific jigs work best under specific conditions. 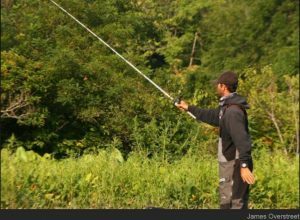 I sort my jigs into three categories, and then I think about size. When I’m fishing a jig in rock I want one that has a wide head. As you look at it the head should stretch out left and right from the center point. A football head is an excellent example of what I’m talking about. The idea is to keep it from hanging up or wedging in the rocks. That ruins your cast, wastes time and if you can’t get it back costs you money. We developed an excellent jig for just what I’m talking about. It’s the Missile Jigs Head Banger. It has a very broad head that lets you fish the toughest rocks. This one is offered in a variety of colors — six in all — and three sizes. Using a jig around wood can be a real problem if you don’t have the right head design. My preference is for something that has a weight-forward head design. Teardrop shaped is another way to describe what I’m talking about. This lets it slip in and out of thick, twisted wood. You can get down to the fish without ruining everything with a hang-up. It won’t do that, however, unless the line tie is in the right place. I’ve tried darn near every placement ever thought about by man and have come to the conclusion that a line tie at a 60 degree angle is best. My choice is the Missile Jigs Mini Flip. It has the features I just mentioned and, like the Head Banger, it’s offered in a variety of colors and sizes. 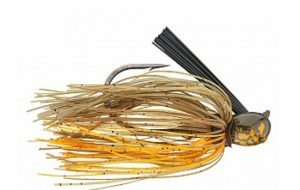 A grass jig needs a sharp head so that it’ll drop through and into grass without becoming all balled up in the stuff. The idea is a clean penetration. That’s really all there is to it other than that the line tie needs to be straight up and vertical. That helps with the clean penetration thing. Pick your jigs for grass applications accordingly. The most important factor when choosing a jig size is forage size, after that it’s the activity level of the bass. If the forage is small, go small. If the forage is big, go big. 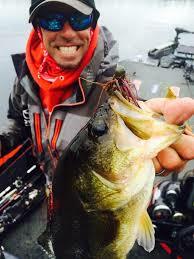 Move up or down from there based on how aggressive the bass are at the moment you’re fishing. Note that I didn’t say the day or the hour you’re fishing. I said moment. What they were doing in the morning doesn’t matter if you’re fishing past noon. Something else of interest: Missile Jigs will have a new jig out soon called the Flip Out. It’ll be a bigger version of the Mini Flip. It’ll let us better match the forage size when it’s big and when we’re fishing in wood.